The Leo Triplet, or the M66 Group, is a group of interacting spiral galaxies located in the northern constellation Leo. The group consists of the galaxies Messier 65, Messier 66 and NGC 3628, also known as the Hamburger Galaxy. The Leo Triplet lies at an approximate distance of 35 million light years from Earth. The three large spiral galaxies can be seen in a single field of view and are well viewed even in small telescopes. Their galactic disks are tilted at different angles when seen from Earth. 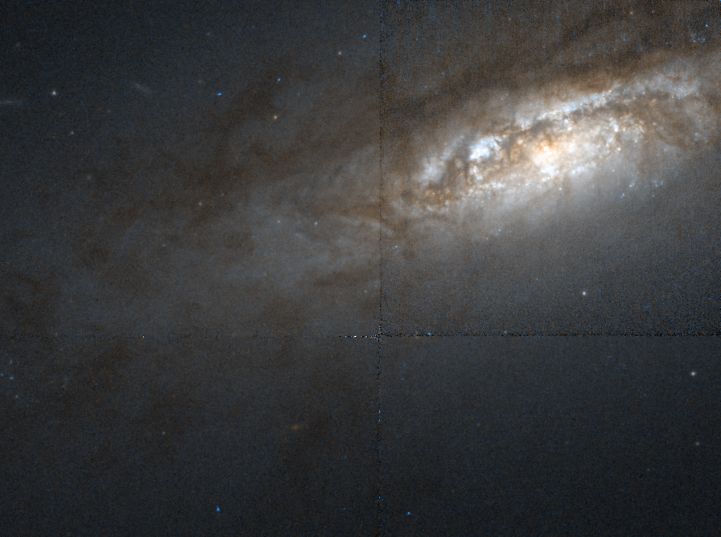 NGC 3628 appears edge-on, while M65 and M66 are inclined enough to reveal their spiral arms. 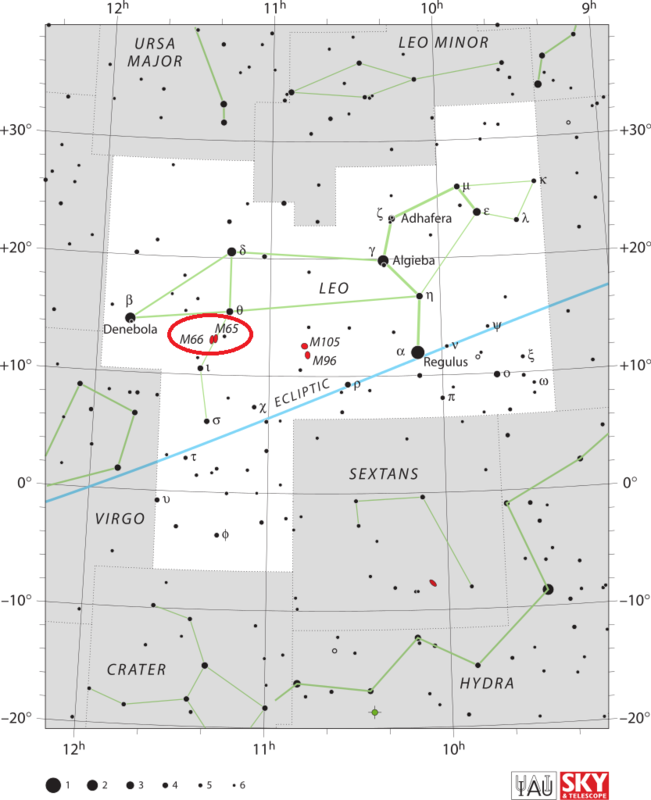 The M66 Group is located in the eastern part of Leo constellation, along the line from the bright star Denebola to Regulus. The galaxies are located between the stars Chertan, Theta Leonis, and Iota Leonis. Messier 66, the largest and brightest member of the Leo Triplet, is roughly 95 light years across. It has an apparent size of 9.1 by 4.2 minutes of arc and an apparent magnitude of 8.9. Messier 65 has a visual magnitude of 10.25 and occupies an area of 8.709 by 2.454 arc minutes of apparent sky. It is an intermediate spiral galaxy, poor in dust and gas, and shows little evidence of star formation. NGC 3628 is an unbarred spiral galaxy with a visual magnitude of 10.2. Seen edge-on, the galaxy occupies an area of 15 by 3.6 arc minutes and appears transected by a broad band of dust that stretches along its outer edge, hiding the young stars in the galaxy’s spiral arms. 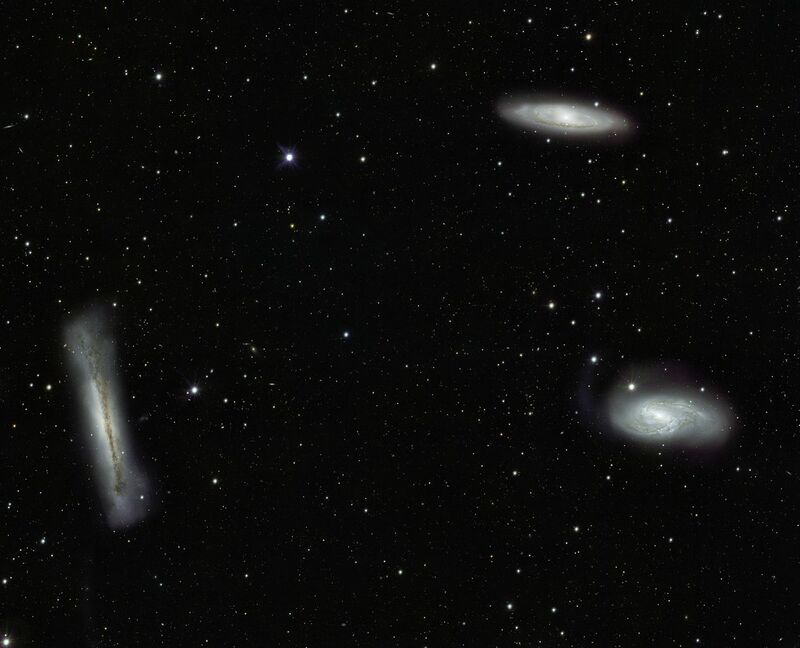 The three galaxies in the M66 Group have all been affected by gravitational interactions with each other. This is evident in the deformed, drawn out spiral arms of M66 that are experiencing a high rate of star forming activity and in the warped, inflated disk of NGC 3628. With a prominent tidal tail consisting mainly of young blue stars, NGC 3628 seems to be the most affected of the three, while M65 appears to have suffered the least damage from the interaction. The tidal tail of NGC 3628 spans over 300,000 light years, but is very faint and does not always appear in images of the galaxy. The disk of M65 appears a bit warped and there is evidence of a relatively recent burst of star forming activity within the galaxy, indicating that M65, too, is tidally interacting with the other galaxies in the M66 Group. Some sources refer to one or two nearby galaxies as possible members of the M66 Group. The lenticular galaxy NGC 3593 is frequently identified as a member. NGC 3593 is a starburst galaxy and known to contain two populations of stars that are rotating in opposite directions. With an apparent magnitude of 12.6, the galaxy is somewhat fainter than the other three. It occupies an area of 1.5 by 1.1 arc minutes of apparent sky and lies at a distance of 20.5 million light years from Earth. NGC 3593. Based on observations made with the NASA/ESA Hubble Space Telescope, and obtained from the Hubble Legacy Archive, which is a collaboration between the Space Telescope Science Institute (STScI/NASA), the Space Telescope European Coordinating Facility (ST-ECF/ESA) and the Canadian Astronomy Data Centre (CADC/NRC/CSA). 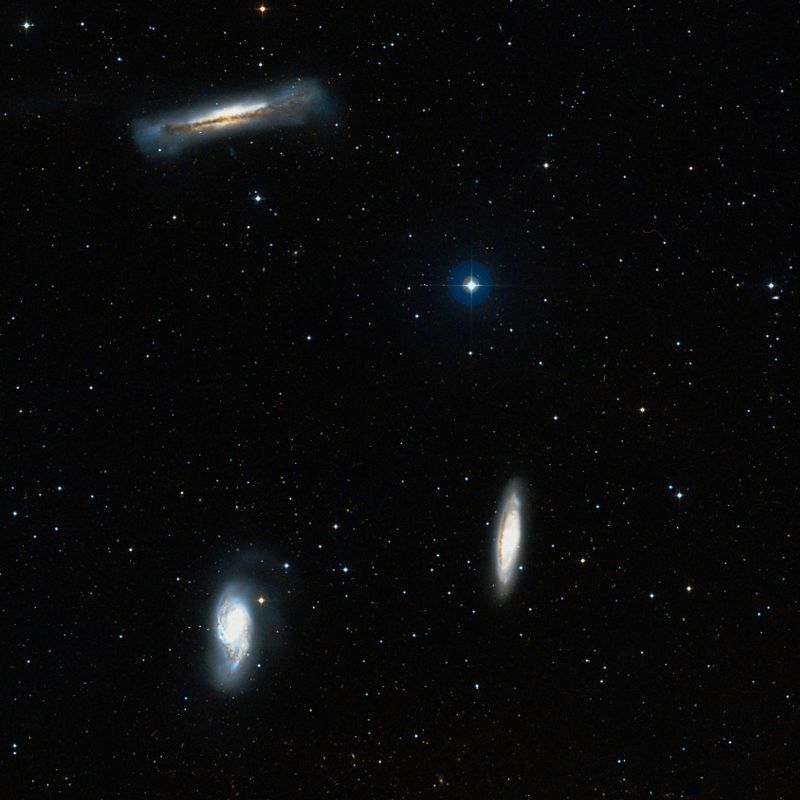 The Leo Triplet lies close to the M96 Group, also known as the Leo I Group, another group of galaxies found in the Leo constellation. 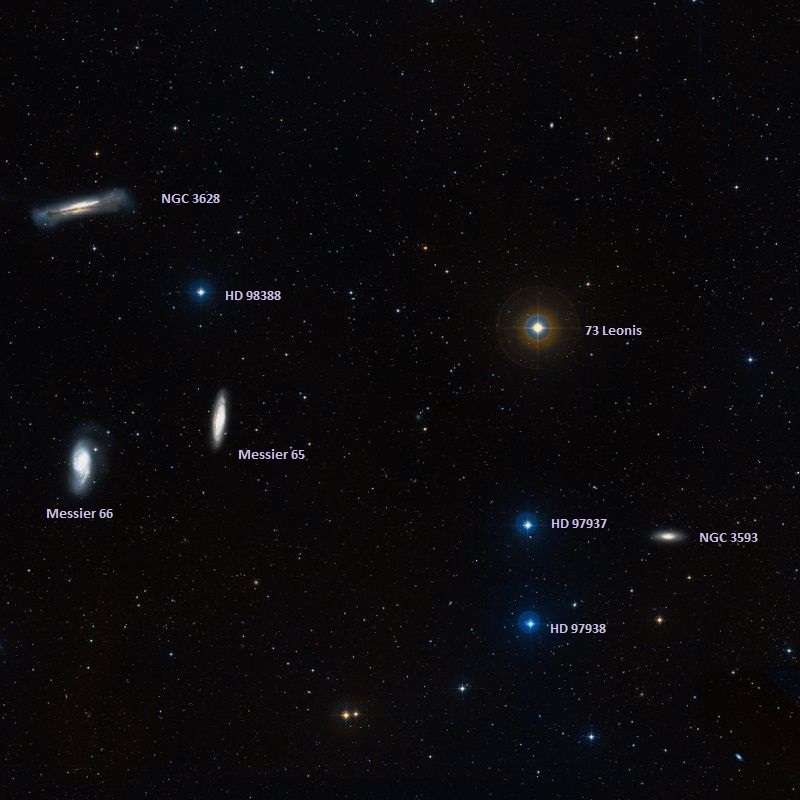 The M96 Group contains up to 24 galaxies, including the spiral galaxies Messier 95 and Messier 96, and the elliptical galaxy Messier 105. As the two groups are physically close, some sources identify the M66 Group as part of the M96 Group. The two groupings may in fact be separate parts of a considerably larger galaxy group. 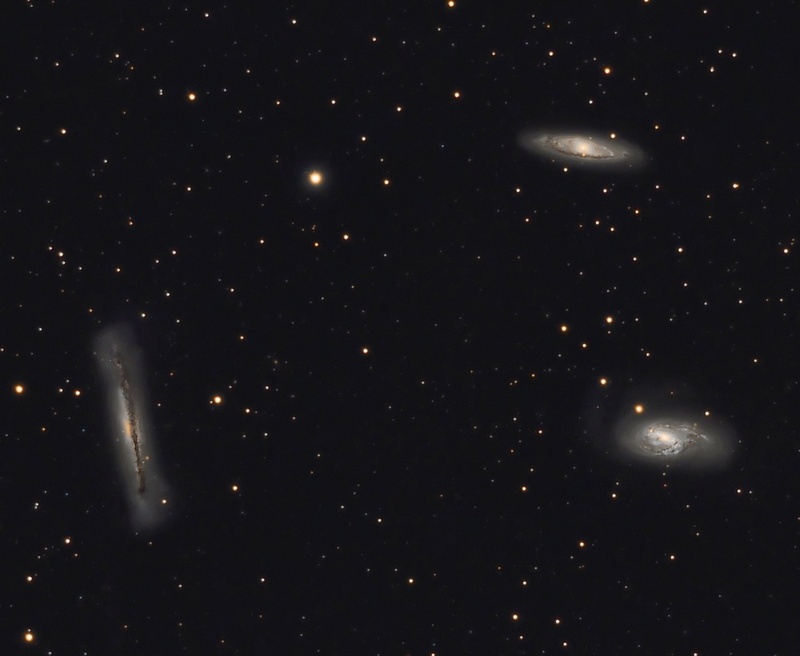 The M66 Group is also catalogued as Arp 317, LGG 231, NOGG P1 533 and NOGG P2 543. Halton Arp included Messier 66 separately in his Atlas of Peculiar Galaxies as Arp 16.